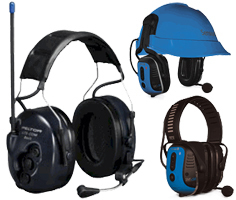 2-Way Communication Ear Muffs with Built-In Radio provide safe 2-way radio communications in high-noise environments, and each set of ear muffs or ear plugs includes a mic and a fully-functioning radio unit - no external radios or other devices required. These are the ideal solution for very loud environments in which members of a team of two or more need to maintain communications and still have continuous protection from hazardous environmental noise. EARMARK offers a unique line of communications headsets and the capability to configure a system that will meet your unique requirements. The EARMARK line of headsets includes three primary models, Series 4, Series 5, and Valcomm 900. When used in conjunction with various accessories, including a repeating headset, a base station, modular systems, and replaceable external battery packs, your EARMARK communications system can be configured to meet the requirements of most any industrial, military, law enforcement, city government, or construction environment. (NRR 28) Peltor LiteCom PRO III earmuff-style communications headsets provide built-in two way radio with 70 programmable channels. Also features wireless Bluetooth® capabilities, a 22-hour battery life, ambient listening, and protection from hazardous noise. (NRR 28) Peltor LiteCom PRO III Intrinsically Safe earmuff-style communications headsets provide built-in two way radio with 70 programmable channels, plus wireless Bluetooth® capabilities, a 22-hour battery life, ambient listening, and protection from hazardous noise.